Tonight was an early bird special night. Ironically, as I suggested this meal, I felt like I was 60 years old. We had to get ready and eat early since Max (9) had is school play tonight. You all know I love breakfast for dinner! So, when we got our Christmas citrus fruit from my parents (a tradition they passed down from my grandparents - Thanks Mom and Dad) we all dug into it immediately! Max asked if I would cut the grapefruit in half and cut out the wedges. I never do this with citrus fruit (I peel it or supreme it), so it was a novelty for him. It took me right back to being a kid, eating breakfast at my grandparents house in Florida. This was the perfect fuel to get us to the school for the fantastic performance we saw tonight. 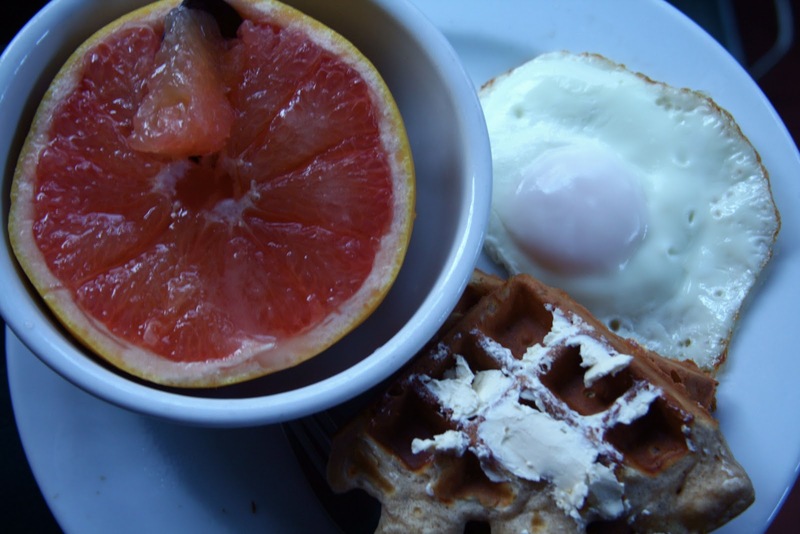 Fresh grapefruit, an over easy egg and waffles. 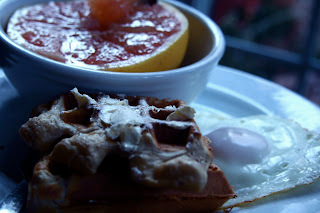 These waffles were ridiculously easy...fluffy on the inside and crunchy on the outside! Mix the dry and then pour in the milk. Stir just until combined and cook according to your waffle iron. Does your family have a traditional gift they give to you? My parents started this one last year after my grandfather passed away to keep his tradition alive. I love this kind of stuff. Food is such a big part of who I am and I have such a romance with it. SSHHH don't tell Tony! I like getting these kinds of gifts. They have meaning and they are darn tasty. Although, I think the boys would be more into the bacon of the month club, but don't tell them about that one please. That's great that you guys have traditions like that. The only one I can really think of is that on Thanksgiving dad makes spaghetti and on Christmas it's manicotti. Jason and I are sort of starting our own traditions like brunch for Christmas and our own vegetarian Thanksgiving dinner just the 2 of us. My dad always makes which ever child is up first on Christmas' favorite breakfast (pancakes for me, popovers for my brother). Even now that we are 25 and 23 we still race to be the first one! 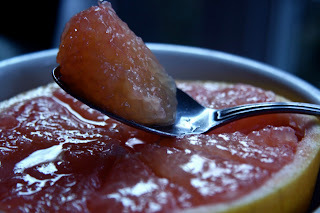 i ALWAYS section out my grapefruit like that and sprinkle a lil sugar on it too :) omg memories! ironically i have 2 grapefruit in the fridge...right now! That's tomrorow's breakfast after seeing this post! Well. Your tradition is much nicer than mine. Since I'm the quirky and spontaneous oldest child, I come home with gifts in tow- a bottle of wine for my mom and a pint of crown royal for my dad. I'm a fan of eating dinner early. And breakfast for dinner too. Ooooh, that grapefruit looks so good!! That reminds me of my childhood too! I've never had grapefruit. Weird huh? Your tradition is cute. Our dad sends FL oranges and grapefruit all the time. He has been doing for many years now! Everyone in the family gets a big box of them! I love that tradition! We don't have a tradition like that, but we do bake certain cookies each year and give them out.